Few album releases get the kind of accolades that have been directed at 'Goin' Home' by Georgia-based Whosoever South. TheAntidoteRadio.com suggested the CD "has to be considered one of the outstanding albums released in 2013," BlackGospelBlog.com called it "a likely contender for top album of 2013" while Cross Rhythms ourselves have called it "a cohesive soundscape of pristine originality." Whosoever South's originality comes from blending three seemingly diverse music forms - ancient spirituals, hip-hop and bluegrass - into something truly fresh. The group consist of husband and wife Rowdy and Sarah Eunice and longtime musical partner Mike Mitchell. Rowdy spoke to me about the band and their ministry and I began by asking him how a band still fairly unknown beyond their homebase of Georgia could get one of mainstream music's top producers, Asaf Fulks (Young Jeezy, Lil Wayne), to work on 'Goin' Home'. Said Rowdy, "The only explanation I have is that the Lord intervened. It had nothing to do with us. It was amazing how the relationship came together. Asaf is in southern California, we're in southern Georgia - all the way across the States from each other. Only the Lord can open up doors that way; he gets all the glory and all the credit for it. A friend of mine went to college over there - Santa Ana - and when he came back to Georgia he knew we'd been making music. He said, 'I met a guy in California, a pretty well-known producer, and you may just give him a shot.' He hasn't worked with many Christian artists - we may be the first sold out Christian artists he's worked with. I called Asaf and he was like, 'Send me something, let me see what y'all doing'. I sent a song off of one of our previous albums and he immediately called me back. He said, 'I'm all in this with you. I love what you're doing, and I want to dedicate my time to it. Let's do it.'" Rowdy spoke about the band's origins. "All three of us - myself, Sarah and Mike - were born in south-eastern Georgia. It's an hour to town where we was raised, where we live at. We enjoy that type of rural lifestyle. We've moved around a little - we've lived in the city, had a part of that - but we came back to our roots, where we was raised, the type of life our family had." 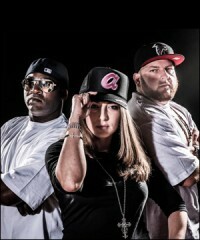 A decade ago the trio were involved in a regionally successful mainstream act, Solid Ground. They opened for major artists such as Kanye West, Outkast and Ciara. But just as major labels were beginning to show real interest the group's personal lives were spiralling out of control. Said Rowdy, "2004, 2005 everything started destroying itself, we started falling apart - people starting dying inside of our camp, going to prison. I felt the Lord drawing me away from that. At the time, I knew of Jesus, but I didn't really KNOW him. In 2006 I ended up in a country church in the backwoods of Georgia. The Lord had just drawn me in that morning. I wasn't a churchgoer. The Lord knocked on my heart, and that time I just surrendered - I gave up to him. Sarah and I dedicated our lives to Christ in 2006. We laid music aside: we wanted to focus on God's word. In 2008 he showed me the gifts he had given me in my mother's womb, that I was using them for myself, for worldly things, but he wanted me to use them to glorify his kingdom. So in 2008 we formed the group Whosever South, and we've been serving the Lord together ever since." Whosoever South's groundbreaking blend of spirituals, hip-hop and bluegrass came naturally to the group. Said Rowdy, "We had done some more commercial-type hip-hop, but it never felt very comfortable. You notice in our music we do many different genres, but our traditional genres would be the tracks like 'Goin' Home', 'Where We From', 'All The Time' with the Southern feel to it." Prior to 'Goin' Home' Whosoever South released three independent albums. Explained Rowdy, "The first one we done was called 'In The Trenches', and that's actually the name of our ministry. The second one was called 'I'm Saved'. It's funny how the names of our albums follow our life period. There were 18 tracks on 'In The Trenches'. That was our first experience of getting out and ministering the Gospel to people; I think we did 120 shows in our first year in ministry. We were going in the trench - not only the bad parts of town, but only where Christ isn't being preached and the truth isn't being told. The next album was 'I'm Saved' - 14, 15 tracks on it. It was more just getting fired up in the Lord, encouraging Christians to stand up: 'Let's do something!' The third album was called 'Run The Race' - come out of Hebrews where he says, 'With endurance, keeping our eyes on Jesus, that we run this race'. That's the period we were at: we were praying the Lord would give us endurance and strength, to run this race." Releasing independent albums and playing concerts here, there and everywhere for whatever those who booked them could afford was financially pretty precarious. Said Rowdy, "That's been the story of our ministry. We thank the Lord: I have a good job, Mike has a great job, and we're able to fund our ministry at this point. We pray this album moves it to another level where the Lord will open up doors and we can move it to another level." Moving on to their 'Goin' Home' epic, I asked Rowdy how on earth he managed to get bluegrass musicians to play on a rap record. Laughed Rowdy, "The banjo player lives right around the corner from me, and so do all of these musicians. Sarah and I have a studio; we bring in separate artists. The harmonica player on every track we do is my father-in-law - Sarah's dad - a very great musician. We just bring in friends that love jamming and playing music." I asked Rowdy how the band responded to 'Goin' Home''s glowing reviews. "It's been very humbling. We never want to get ahead of ourselves. The reviews are great - we appreciate the reviews - but we want to keep our minds focused on the Lord, remember why we're doing what we do, and that's to see lives changed. If we never make one dollar, that's okay, because I've seen lives changed. That's what everything we do is motivated by: preaching the Gospel." I asked Rowdy for his thoughts about making music which brings to the fore the sad reality that much of the Church in the USA is still divided on racial and cultural grounds. As well as the sad truth that many fellowships condemn all hip-hop out of hand. Have Whosoever South encountered such attitudes? "Many times have we faced that, and we've used it as a stepping stone to grow. Many times the youth pastor will book us, and the congregation wouldn't know what's going on. We've walked in churches and it's looked so scary you could feel the condemnation so strongly that you almost wanted to leave. But we've never left a church: we've always persevered. 100 per cent of the time, before we leave, everything is perfect. They've loving it, they've heard the Gospel presented in this music, they have a new respect for this type of music and this generation. It's always ended up positive, but it hasn't always felt positive going into it. We were recently on a 10-day tour and we did eight cities, from Ontario, Arkansas, Nashville, Atlanta - every day there was a test against us. There's going to be trails, persecution, temptation every day of our life. What that does it pull you closer to our king. We have to have him every minute. We take great joy in those."